Figure 1. 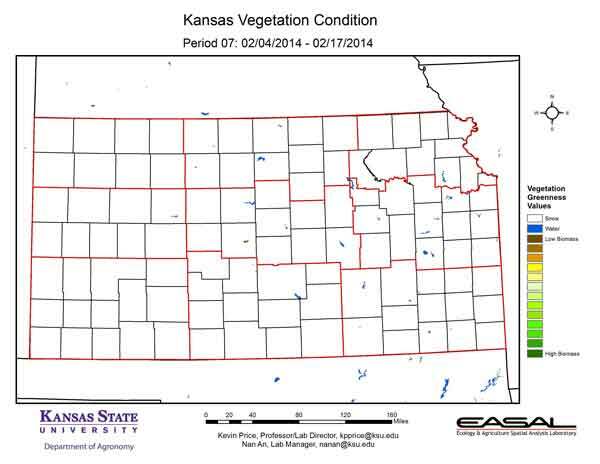 The Vegetation Condition Report for Kansas for February 4 – 17 from K-State’s Ecology and Agriculture Spatial Analysis Laboratory shows that snow was a feature across the entire state. Most of the snow cover had melted by the end of this two-week composite period. Figure 2. 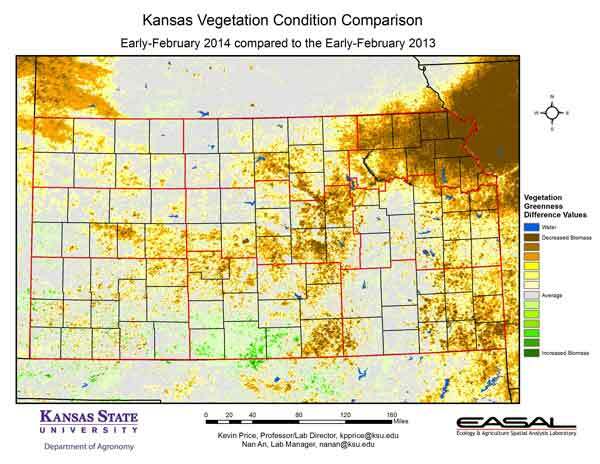 Compared to the previous year at this time for Kansas, the current Vegetation Condition Report for February 4 – 17 from K-State’s Ecology and Agriculture Spatial Analysis Laboratory shows the Northeastern Division has the biggest decrease in NDVI readings. In this region, cold wet weather and persistent snow cover has limited vegetative activity this year. Figure 3. 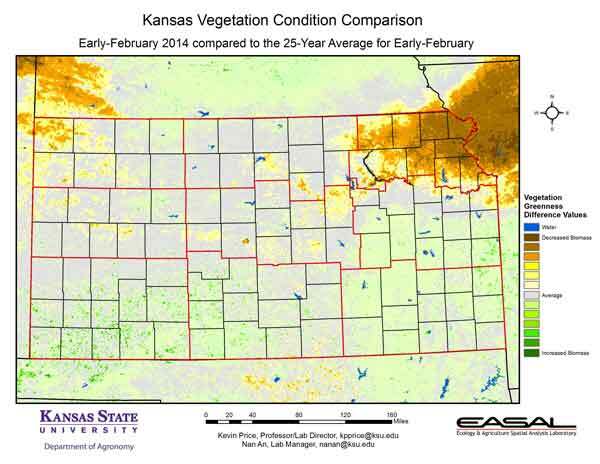 Compared to the 25-year average at this time for Kansas, this year’s Vegetation Condition Report for February 4 – 17 from K-State’s Ecology and Agriculture Spatial Analysis Laboratory shows the Northeastern Division has the biggest departure from average. It is also the division where the average temperatures are showing the greatest departure from average. At the end of this two-week composite period, the average temperature was just 19.4 degrees F, or 11.5 degrees cooler than normal. Figure 4. 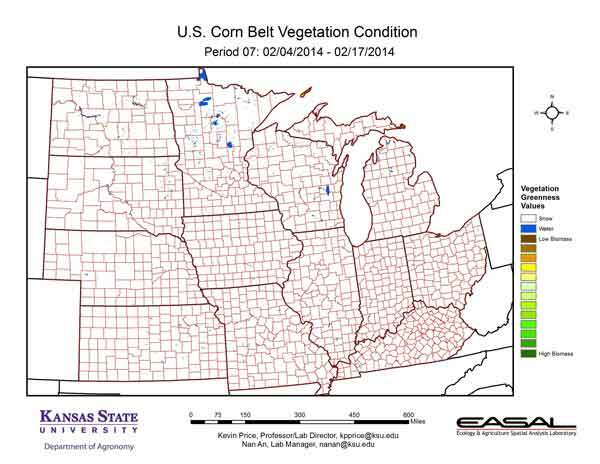 The Vegetation Condition Report for the Corn Belt for February 4 – 17 from K-State’s Ecology and Agriculture Spatial Analysis Laboratory shows that the snowy season has continued throughout the region. During this two-week composite period, the northwestern parts of the Corn Belt had more snow than earlier in the winter, with average snow depths approaching 7 inches. Figure 5. 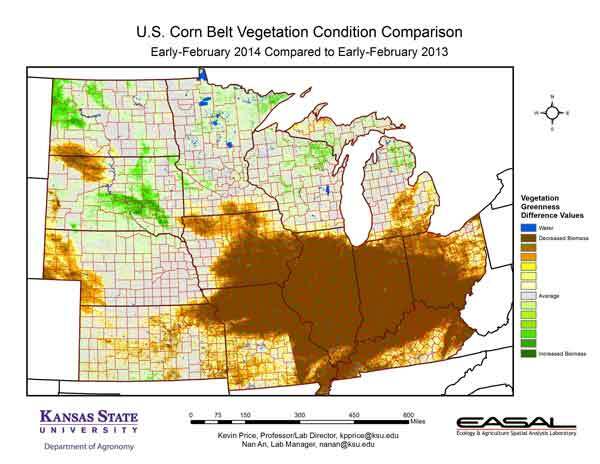 The comparison to last year in the Corn Belt for the period February 4 – 17 from K-State’s Ecology and Agriculture Spatial Analysis Laboratory shows that the biggest decrease in vegetative activity has been in the center of the region, from southeastern Iowa to northern Kentucky. Temperatures have had a big role in this departure. For example, in Illinois, at the end of January temperatures were averaging 6 degrees below normal. Last year, also at the end of January, temperatures were averaging 2 degrees above normal. Figure 6. 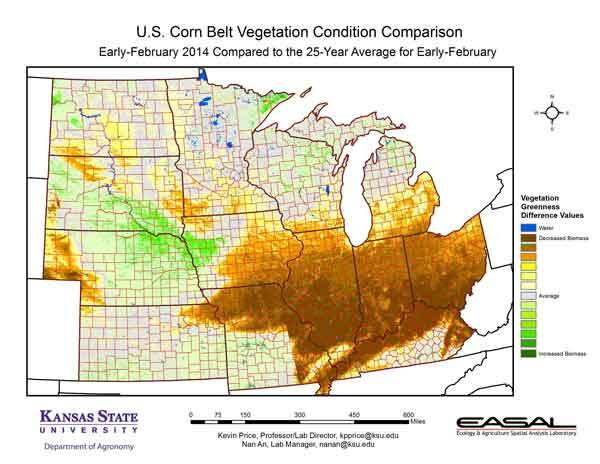 Compared to the 25-year average at this time for the Corn Belt, this year’s Vegetation Condition Report for February 4 – 17 from K-State’s Ecology and Agriculture Spatial Analysis Laboratory shows cool wet weather continues to suppress vegetative activity. Temperatures are running from 12 to 6 degrees below normal this year. Figure 7. 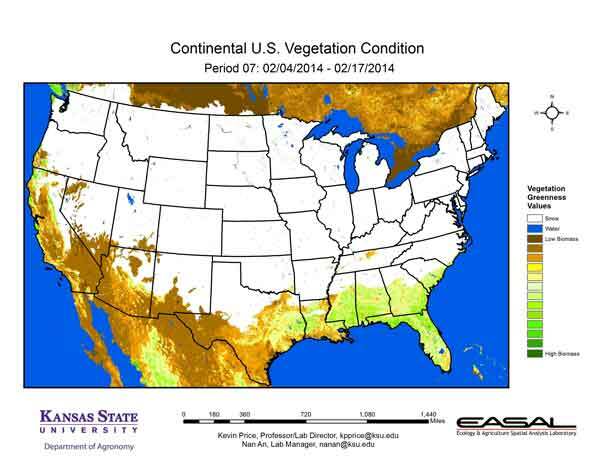 The Vegetation Condition Report for the U.S. for February 4 – 17 from K-State’s Ecology and Agriculture Spatial Analysis Laboratory shows that while the most recent snow didn’t penetrate quite as far south as earlier storms, it still made it as far as the northern parts of the Gulf Coast States. In the western areas, while the moisture was welcome, it had minimal impacts on the continuing drought. Figure 8. The U.S. comparison to last year at this time for the period February 4 – 17 from K-State’s Ecology and Agriculture Spatial Analysis Laboratory shows that biggest decrease in NDVI readings are in areas around the Ohio River Valley and along the California coast. In the east, cooler temperatures have limited photosynthetic activity. The continued drought is the major factor for decreased activity in the West. Figure 9. The U.S. comparison to the 25-year average for the period February 4 – 17 from K-State’s Ecology and Agriculture Spatial Analysis Laboratory shows that the biggest decreases are in the east and along the California coast. 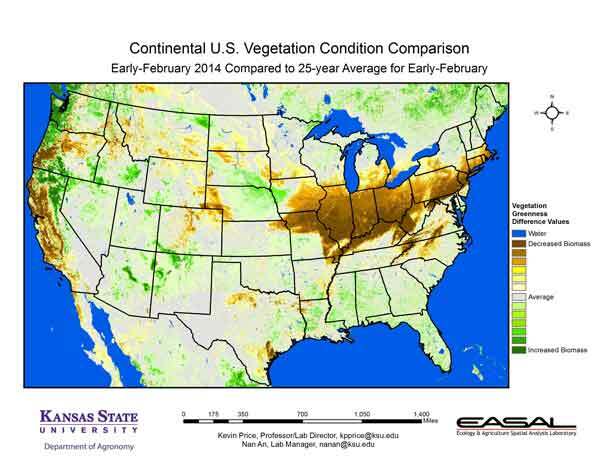 Cooler-than-average temperatures, coupled with persistent snow, have reduced vegetative activity in the East. Along the West Coast, continued drought has had a negative impact on vegetation. Even the areas with increased vegetative activity along the Pacific Northwest are negative, as it indicates lower-than-usual snow pack.